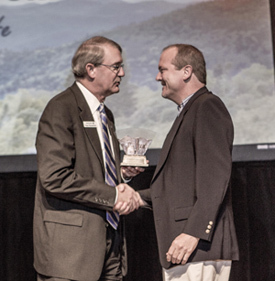 At the 116th Annual Meeting in June, the Asheville Area Chamber of Commerce honored outstanding companies and individuals. Every year, the Asheville Area Chamber of Commerce honors two individuals as Small Business Leader of the Year, sponsored by HomeTrust Bank. One award is given to an individual from a company with under 16 employees, and the other is given to an individual at a company with 16 or more employees. Selected from community nominations, winners clearly reflect quality and dedication in the operation of business in the Asheville area and exhibit leadership accomplishments including innovation, initiative and civic responsiveness. Steve Frabitore of Tupelo Honey Cafe was chosen as 2013 Small Business Leader of the year in the category of 16 or more employees. Steve purchased Tupelo Honey Cafe about six years ago and has since transformed the popular restaurant into an empire. Sales at the original downtown store have grown by over 200%, a second Asheville store was opened and by the end of 2013 there will be six Tupelo Honey Cafes throughout the Southeast. His success has garnered him recognition as the 2012 North Carolina Restaurateur of the Year by the North Carolina Restaurant and Lodging Association. "His passion for offering our guests flavorful food that is well thought out, tested and implemented allows us the good fortune of remaining a leader in southern cuisine after 12 years in business," said Alan Wolf, Vice President of Operations at Tupelo Honey Cafe. "Steve's passion for perfection is amazing and his ability to drive every decision by a guest-first focus makes him an excellent leader." While growing the business, Steve has also kept an eye out for supporting the community. Tupelo Honey Cafe sponsors Go Kitchens, a job rehabilitation outfit for restaurant workers in Asheville, has provided food for families in need from local elementary schools and donated funds for building the Estes learning garden. Tupelo Honey Cafe teaches children's food nutrition to 2-4th graders in Buncombe County, NC, Knox County, TN and Greenville County, SC. "Steve, as many Asheville leaders, embodies the spirit of our city, our region and of our best leaders," Wolf said. "His selflessness is genuine, his gratitude of guests and employees is inspirational and his drive and vision to create opportunity for those around him is truly unique."